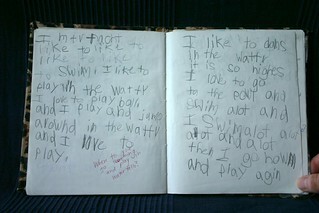 I mtr facht like to like to like to like to swim. I like to play in the wattr I love to play ball. and I play and jamp arownd in the wattr and I love to play. I like to dans in the wattr it is so nighes I love to go to the powl and swim alot and I swim alot alot alot and alot then I go howm and play agin.